Say what you wanna say, and let the words fall out…so you wanna see someone be brave, Sara Bareilles? 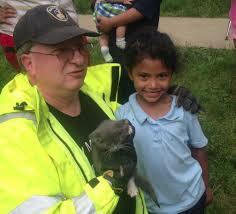 Try six-year-old Janeysha from Lancaster Township in PA.
A little kitty was stuck in a storm drain. Janeysha’s mom called the hunky firefighters to help. But their massive build prevented them from crawling down there. Enter Janeysha. She volunteered to scoop up the trapped kitty, despite her fear of being bit by it. Mission accomplished. And not only is the preteen a local hero, she has no scars. As for the kitty, now named Stormy, she’s safe and sound in a animal hospital waiting to be adopted. We’ve already crowned Janeysha queen of chutzpah.